If you have ever followed FlyLady or read her book Sink Reflections then you will be familiar with the concept of Zones. 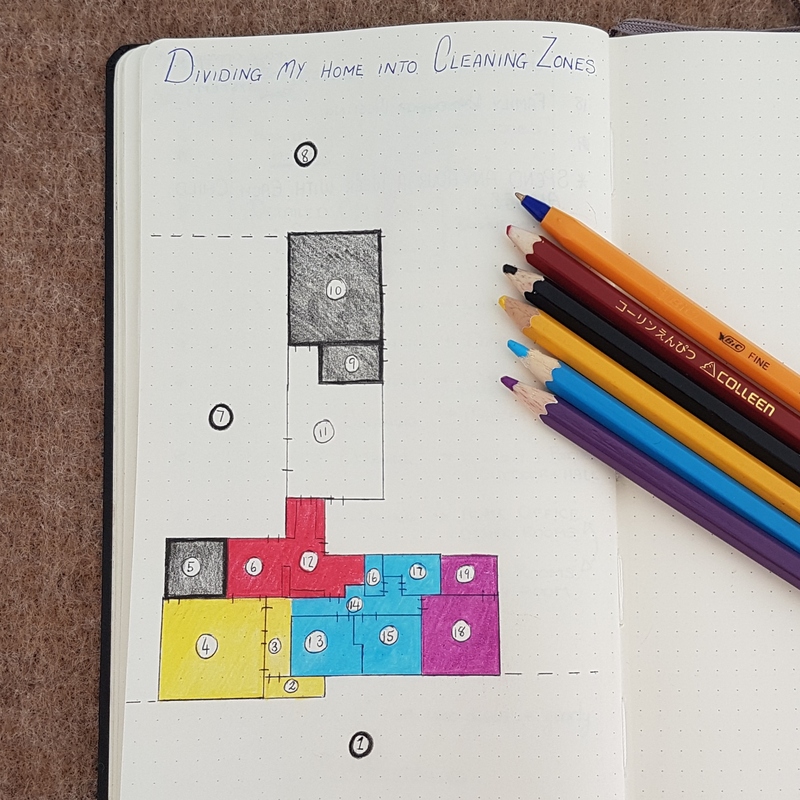 This week I am going to show you how to divide your home into 5 cleaning zones. 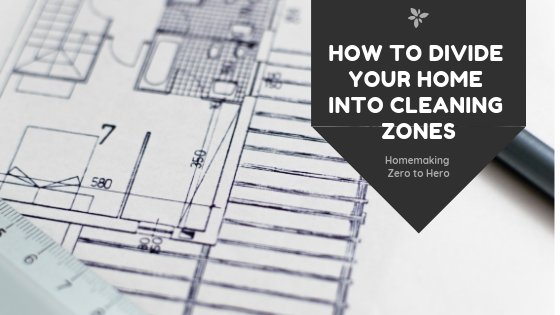 These cleaning zones will be customized to your household and should work for you. While this article can be read as a stand-alone article, it is week 4 of a bigger picture. The name of the series is Homemaking Zero to Hero in 52 weeks. I recommend going back and taking a look at previous weeks in the series to get up to speed on what we have done so far. Here is the video associated with this post. The video is a broad overview of the post below. 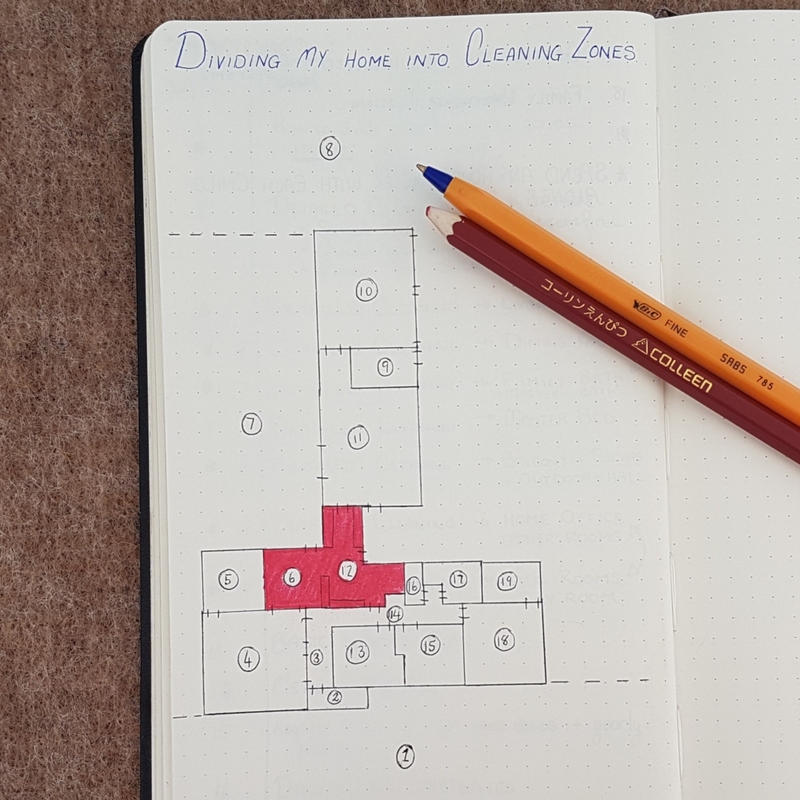 To divide your home into cleaning zones, the first thing you will need is a floor plan of your house. 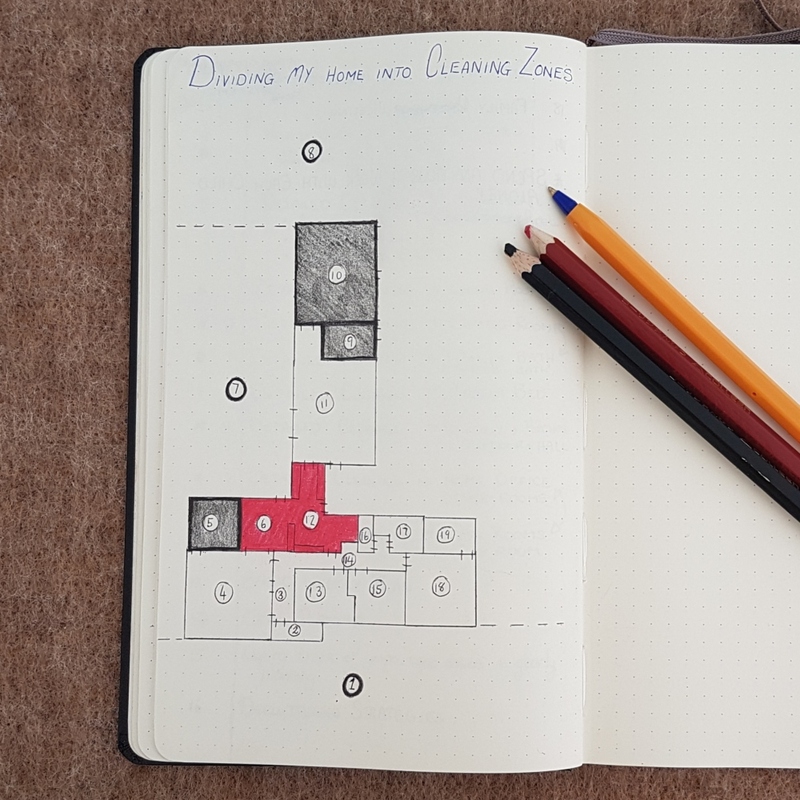 Take out a piece of paper or notebook and draw a basic floorplan of your house. You just need the rooms, don’t worry about adding any furniture. Imagine you are giving me a tour of your home. As we come in the main door, what room are we in? Starting at this room and going clockwise around your home, take me through each of the rooms. Write down the list of rooms as we visit them. Note: This is also a good time to look at the flow of your home and change rooms around if they will work better for a different purpose than the purpose intended by the architect. If a person has an older home you may find that it doesn’t suit a modern life-style. For example, when we had children we could no longer leave the gate open for my husband’s business clients to enter our back yard. This meant our original office was difficult to access. I switched the office and living room around because our living room had the front door and clients didn’t need to go to the back yard. I turned our office into an office and dining room so that my husband had a conference table. This freed up the original dining room to become a living room. This room is open plan with the kitchen allowing me to watch my children while I cook meals. We then discovered we didn’t need the original office, so I turned it into a home school room which I rent out in the afternoons to a music teacher. After all these changes, I am almost happy with the flow of my home, I’m still thinking about what else will make the flow better. Once you have the floor plan, I want you to highlight the main living area of your home, this is the spot where you and your family spend most of your time. This is the heart of your home and the place that you will need to spend the most attention on. The heart of my home is the Kitchen and Living Room. At this step you will go through the floorplan and black out (or brown out) the rooms that you are not responsible for in any way. In my house these rooms are my mother’s room (Granny’s Bedroom), the Band Room and the Garage. I also have very little to do in our garden. Now is the time to look at your remaining rooms. These are the first rooms a guest sees when they arrive at your home. It will include the front porch, entrance hall, front yard etc. In a small apartment it may only include the area immediately around your front door. In my home the entrance includes the front porch, entrance hall and office/dining room. 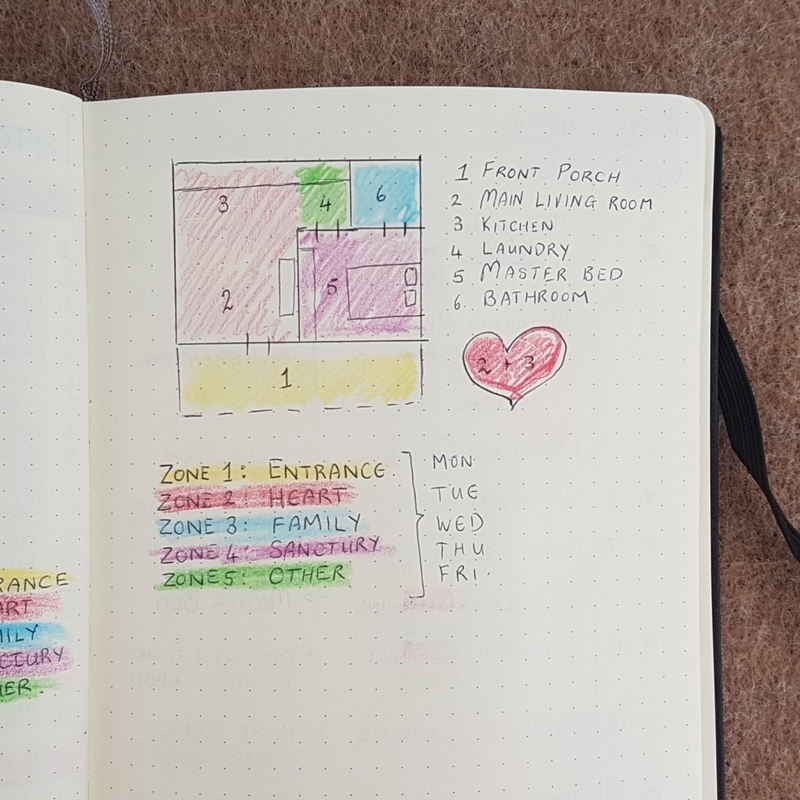 When you select these rooms, keep in mind that most of the time you will only have half a week in this zone, so don’t add too many rooms to it. This area is the heart of the home. My homes heart is the kitchen and living room. The heart of your home may be different. As mentioned earlier, it is whichever room you and your family spend most of their time in. The family rooms are all the bedrooms that belong to family members, and other rooms the whole family use regularly. For example, bathrooms, bedrooms, passages etc. These are not rooms that groups of people use together (unless they share a room). The reason that the play room is part of this area in my home is because the play room is actually my son’s bedroom, but he wanted to share a room with his sister so we put all the toys in one room and all the bedroom items in the other room. The sanctuary is the area that you and your husband go to relax, either alone with each other or alone by yourselves. The Master Bedroom and Bathroom, a craft room, reading room, music room, library, man cave etc. These all count as “sanctuary” areas in your home. If an area is your husband’s sanctuary (such as a man cave), then he should be responsible for keeping it clean. This is the last section. Any room that doesn’t quite fit in the area’s mentioned above will go into this zone. Maybe it is your dining room, pool room, garden shed, attic, basement, homeschool room etc. 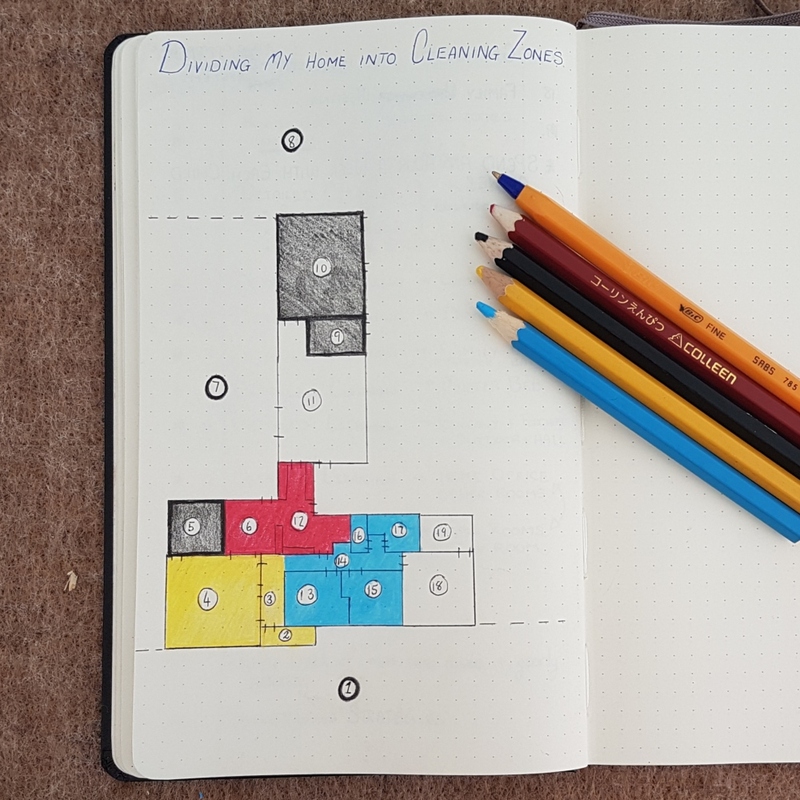 Try to limit Zone 5 to one room because you will only have half a week to clean this room (as with Zone 1). What if my zones don’t fit the mold mentioned above? 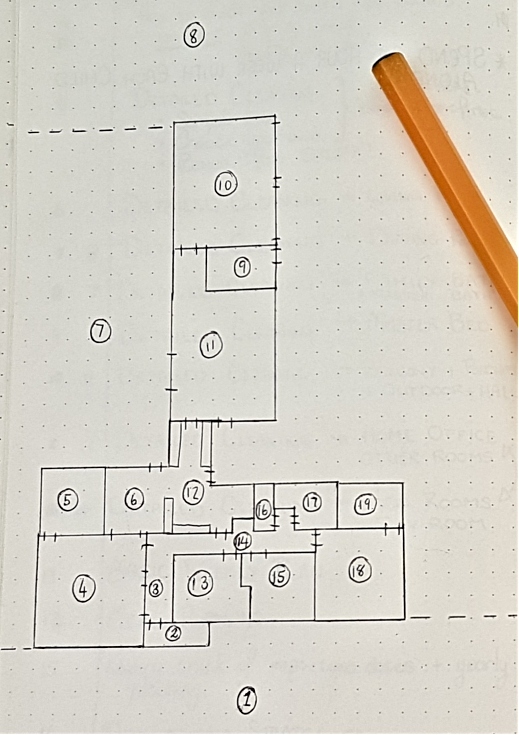 Take the list of rooms in your house (done in step 2) and divide them into 4 equal parts, excluding the rooms you blacked out in step 4. Divide the first equal part in half. The first half becomes Zone 5, the second half becomes Zone 1. The remaining 3 equal parts become Zones 2, 3 and 4. What if my home is really small? If you have any more questions you would like answered, please leave a comment below and I will get back to you. There are two ways you can use zones. Which one you will use depends on your time constraints and the size of your home. If you have a small or tiny home you probably need a daily cleaning routine. Smaller spaces tend to become untidy quicker. You may use a daily system if you are living alone. Of course, change these days around if you need to, but the idea is to spend one day a week on each zone. Don’t make cards for the list above yet. You will be getting all the kitchen cards next week. This is the system that I found works best for me. You can pick one day a week to do deep cleaning, and one day a week to do a quick clean, OR you can do a little bit every day. It is up to you. In the quick clean, you just go through each room and tidy up (about 5 to 15 minutes putting things away were they belong) and then you sweep, vacuum and mop the floor. The deep cleaning is where the zones come in. From the 1st day of the month until the first Saturday (or Sunday if you start your week on a Monday) is Zone 1. Then you do a zone each week after that. 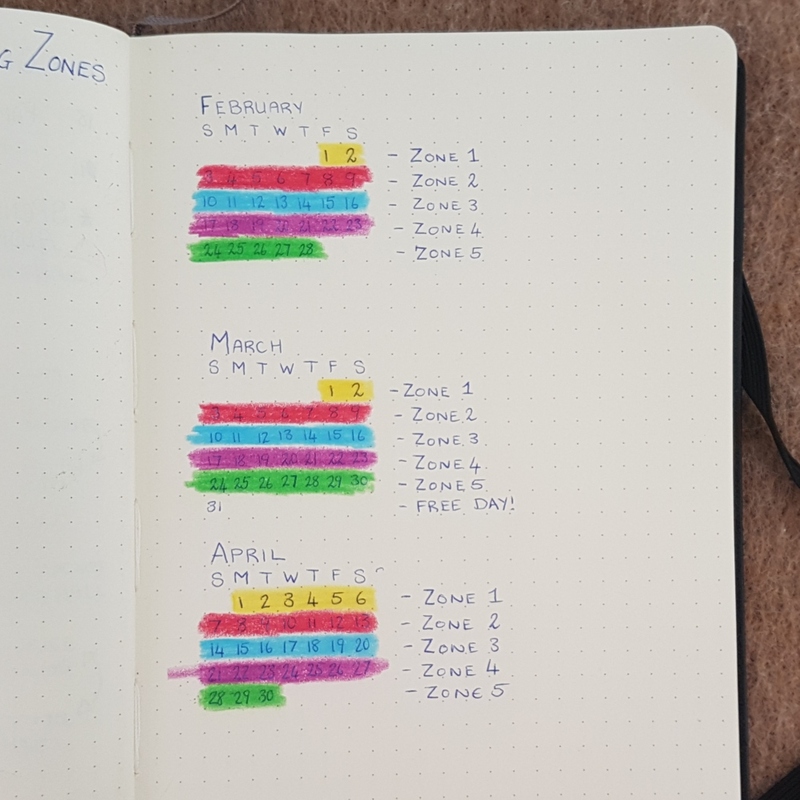 Zone 5 will be the last Sunday (or Monday) of the month until the last day of the month. This means that most months Zone 1 and Zone 5 will share a week. If there are 6 weeks in the month, then the last week of the month will be a few Free Days. Remember the week dividers we created in week one? 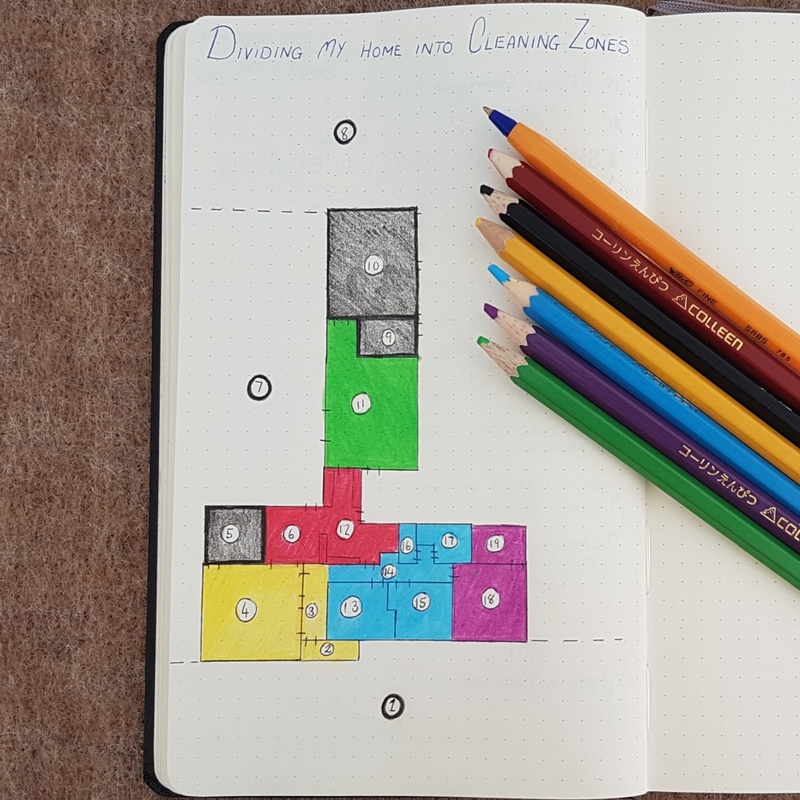 Today you will write your weekly cleaning zone on each divider. If there is a week six, then make it your free week. 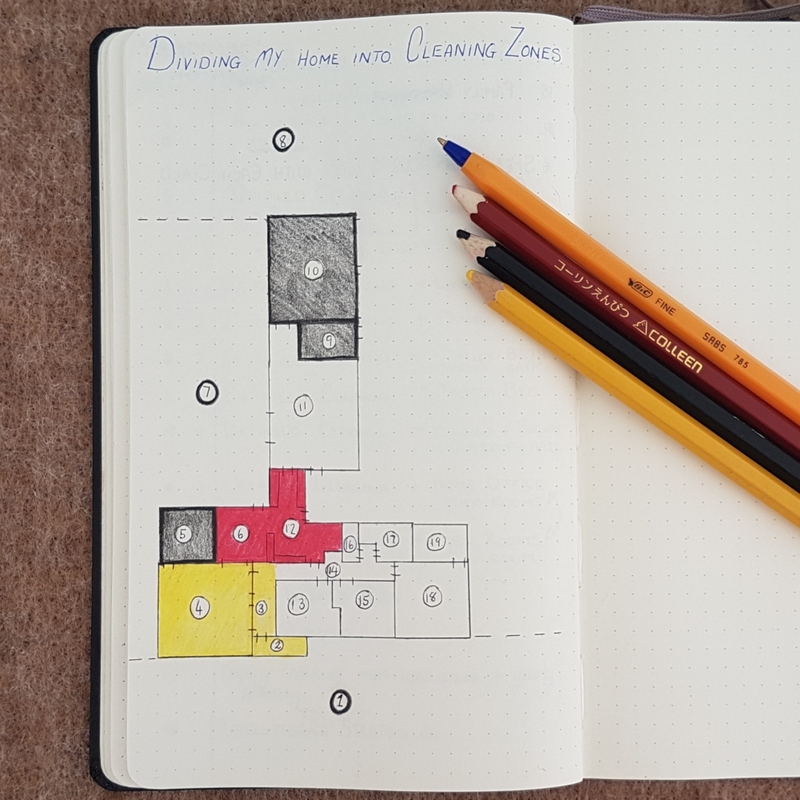 Try to do a few tidy-up tasks in our current zone each day. Get a few boxes from the grocery store for next week! Don’t be scared to change the zones around if you find that they are not working for you in a few months time. Adapt the system to suit your home. From next week you will be adding a lot of cards to your system and we will start with the kitchen cards. Where is your laundry now and when do you do it? My washing machine is in the kitchen. I don’t have a dryer because we live in a semi-arid region. This means we have hot dry weather in summer and cold dry weather in winter. I hang clothes on the washline which is in our back yard. I prefer having the washing machine in the kitchen. My husband’s band room is the original laundry and it was very out of the way.